What great information!! Thank you for sharing. you have truly honored the dandelion with your post, yea! Who knew you could learn so much about a dandelion? You really spent a lot of time on this study and it shows in the images and the products you had to show for you activity. I thoroughly enjoyed your entry and thank you so much for sharing link with the OHC. WOW! What great information! I really like your progression of a dandelion through out the day! I am really excited about your recipe also. Now to find some dandelions! Thanks for sharing! Wow, what a thorough study! Thank you for all your ideas and enthusiasm. What an excellent and interesting post! I followed the link here from the Handbook of Nature Study blog, since I recognized your name from the NaturalKids team! :)I am currently making a dandelion tincture (for detoxification) and I love the idea of making a salve from the flower heads for sore muscles. I'll have to try that for sure. I thought I knew a lot about dandelions. I made dandelion tea a couple weeks ago and read quite a bit then. But your post taught me a whole lot more.Thank you for such a thorough, interesting post. 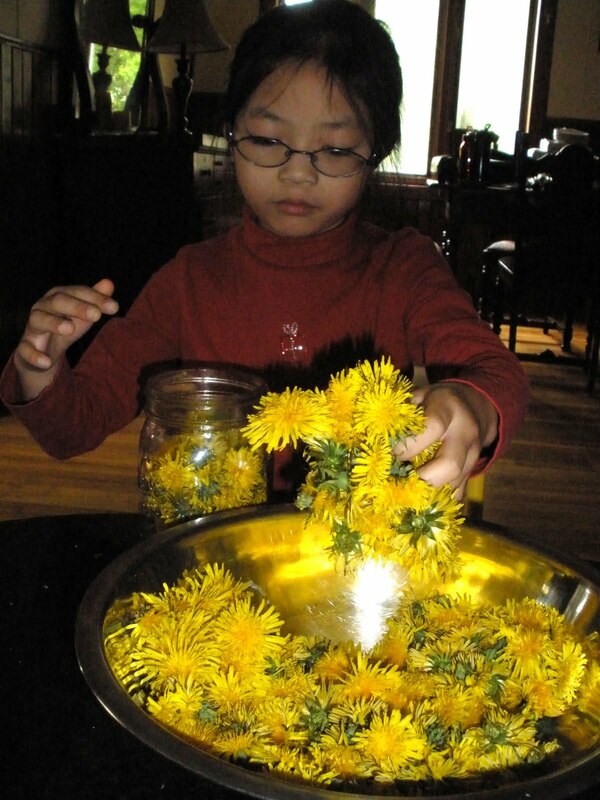 I'll send the little ones out picking dandelions again so we can make some cookies this time! I learned so many interesting new things reading your post! Your girls are beauitful. Thanks for sharing! Great post — you spent a long time putting it together, so thank you! I remember visiting your site frequently a while back ago, when I was really more into following along with a Waldorf Education (http://faulkner-family.blogspot.com) but it's been some time. How lovely to see you at Barb's Handbook of Nature Study Carnival! 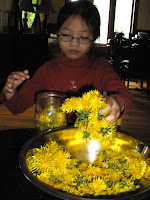 A couple years ago, I shared a story with my children about a dandelion I found at another Waldorf mama's site (Our Little Nature Nest, maybe?) about Star Children. I wish I still had it – it was wonderful! THank you for the information and the neat recipes!! Our yard is, er, blessed with lots of dandelions, so you have given them great purpose now! lovely pictures, fun activities! We loved our dandelion study too! My boys were fascinated to know you can eat the tender new leaves and that they are so noutrishious. Thanks for sharing all the fun ideas! You daughters looked like they enjoyed it! We studied dandelions recently. We focused on the nutritional aspects and healing properties. What fun you had with your girls! Wow, wow, wow! And what a fun, thorough study with gorgeous photos too. on June 3, 2011 at 3:19 am | Reply Susan @ learning ALL the time! !